One of my favorite things about eating at Olive Garden is ordering one of their delicious soups. I think they have some of the best soups on any restaurant menu these days. 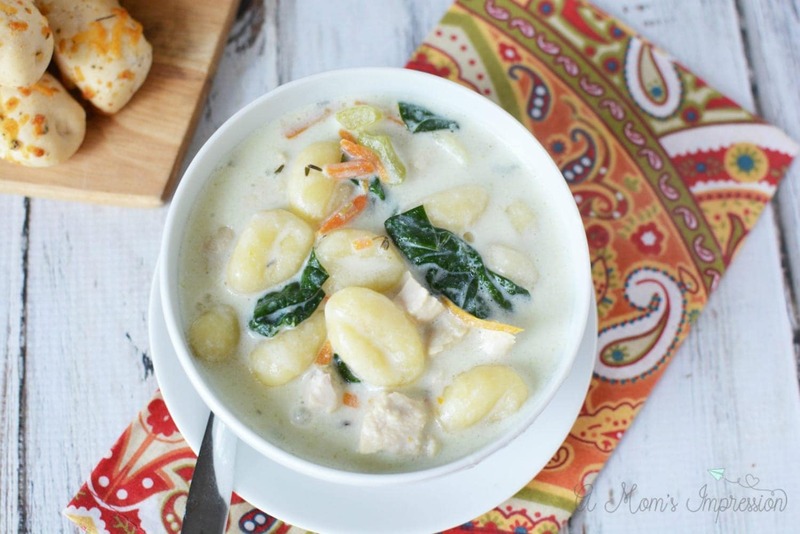 The Olive Garden Chicken Gnocchi is probably my favorite. I am a sucker for a potato dumpling nestled in a delicious broth with spinach and chicken. I knew I had to learn how to create this Olive Garden soup recipe at home so I got out my trusty Instant Pot and got to work. I use store-bought gnocchi but if you make your own little potato dumplings you can use those too. One day I will make my own! The Instant Pot is perfect to use for soups because it makes them seem like they have been cooking all day long when really it takes just minutes. Normally I would could this soup on the stovetop for over 30 minutes but it takes just 4 minutes in a pressure cooker. It is the perfect family-friendly Instant Pot meal. 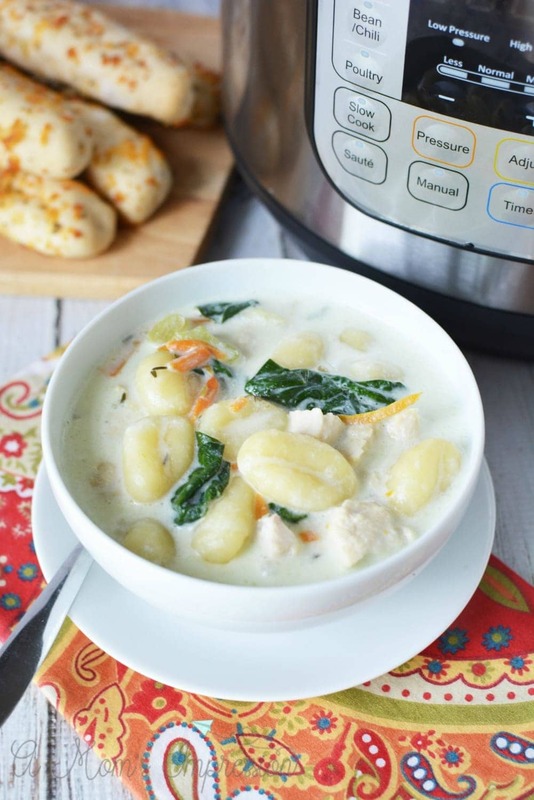 Be sure to check out our Instant Pot Crack Chicken Noodle Soup or our Instant Pot Chicken and Dumplings for more amazing soups that we made in our pressure cooker. Scroll down for a printable copy of this recipe! Place oil, chicken, onion, and celery into your pressure cooker. Saute the ingredients until meat is brown. Add chicken broth, carrots, and thyme and mix well. Place the lid onto the instant pot and seal shut. Close the pressure release valve. Set the instant pot to manual, high pressure for 4 minutes. When the cooking cycle is complete, quick release pressure and open the lid. 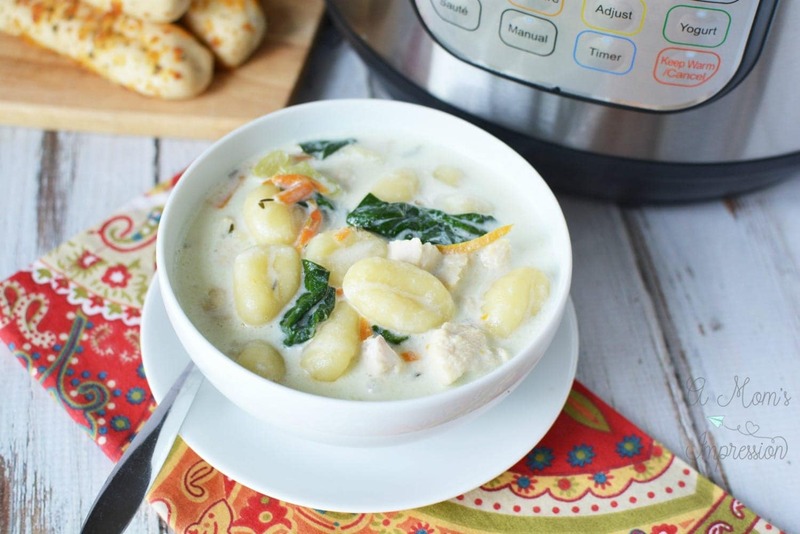 Set the Instant Pot to saute and carefully stir in spinach, half and half and gnocchi. Continue to heat the soup on the saute function until boiling. 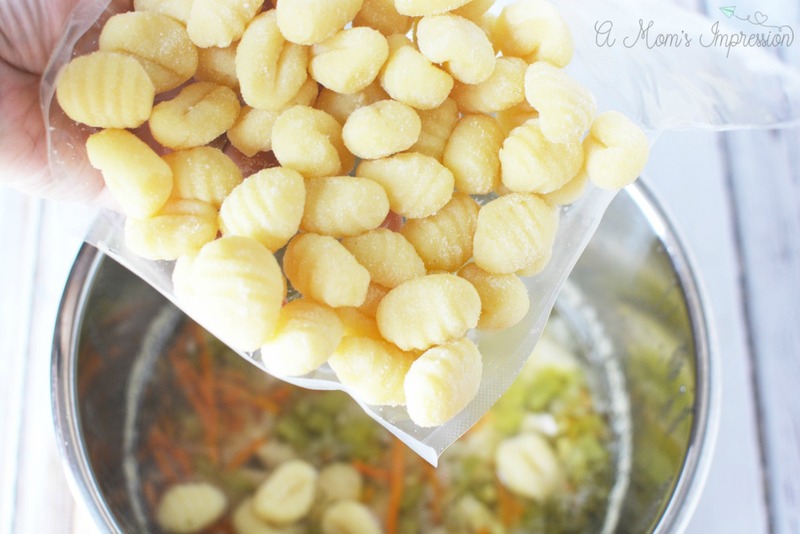 Boil and stir frequently for about 3 minutes or until gnocchi is done. Serve immediately. Add chicken broth, carrots, and thyme and mix well. Place the lid onto the instant pot and seal shut. Close the pressure release valve. Set the instant pot to manual, high pressure for 4 minutes. When the cooking cycle is complete, quick release pressure and open the lid. 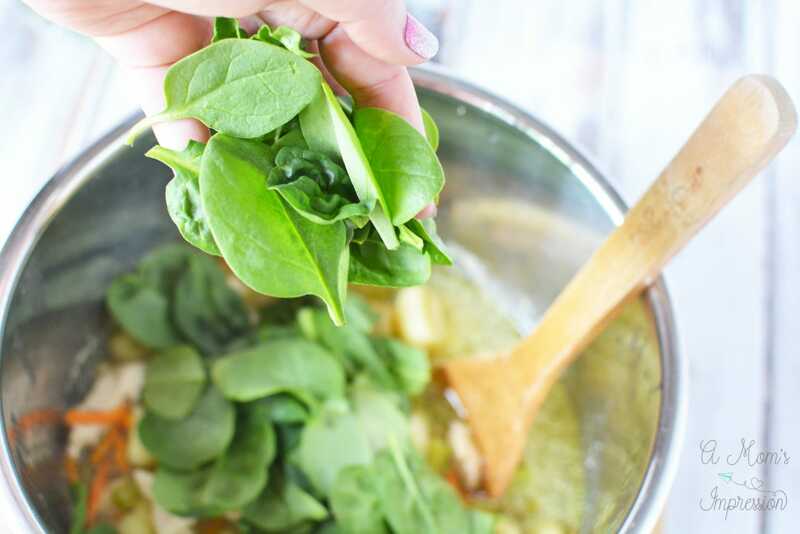 Set the Instant Pot to saute and carefully stir in spinach, half and half and gnocchi. Continue to heat the soup on the saute function until boiling. Boil and stir frequently for about 3 minutes or until gnocchi is done. Serve immediately. *Cooking time doesn't include the time it takes for pressure cooker to come to pressure. « Why I Am Not Afraid to Laugh or Sneeze Anymore! This was absolutely delicious and tasted just like Olive Garden’s soup! I chickened out on the amount of spinach, not realizing it would wilt. So next time I will use the full amount. Excellent recipe. Very easy to do, instructions were spot on! I went to OG and got an order of breadsticks to go. I already have the ingredients to make another batch. Thanks! Yes, I believe you could. I haven’t tried it but it doesn’t fill up my 6 quart so I believe there would be room. Can you double the recipe in a 6 qt Instant Pot? I have not tried it but as long as the liquid doesn’t go above the fill line you will be ok. I think that you could. 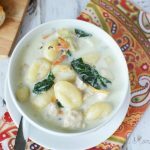 Are the gnocchi used in this recipe fresh or can I use frozen?